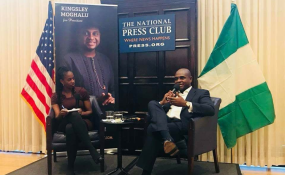 Prof. Kingsley Moghalu speaking at a town hall meeting on April 5, 2018 in Washington DC. Three years ago, I reviewed Kingsley Moghalu's new book, "Emerging Africa, How the Global Economy's 'Last Frontier' Can Prosper and Matter." Emerging Africa is an engaging and profound review of Africa's development challenge from the perspective of a man who could and had observed it from different dimensions. I thought the book was particularly fundamental to the Nigerian situation. By coincidence, it was introduced in the closing stages of the presidency of Mr. Goodluck Jonathan, who had claimed to be implementing a 'Transformation Agenda,' and the dawn of the arrival of Muhammadu Buhari, which was hawking a 'Change' Agenda. As a development treatise, I described 'Emerging Africa' as a "full-frontal analysis of the African condition and a persuasive description of what can be done... a rebuttal to cynical questions as to why Africa is as Africa is, and a decisive proposal about what can come next." For Africa to thrive and benefit from globalization, 'Emerging Africa' advocates a coherent worldview: "a way of thinking or seeing the world that creates an incentive for real change and progress, and not so much about what the actual solutions might be." "If African countries take the first, essential step of upgrading their psychological and mental infrastructure with an appropriate worldview, this potential trajectory can unfold in the next fifty years by 2060," Moghalu argues, providing clear and detailed suggestions about how the appropriate African worldview may be established. I have yet to read Moghalu's follow-up work, "Build, Innovate and Grow (BIG)," subtitled "My Vision For [Nigeria]," which was launched in February. Coincidentally, that was the month in which Nigeria overtook India as the extreme poverty capital of the world, and the month the International Monetary Fund warned that Nigerians are becoming poorer. Two weeks ago, in Abuja, Microsoft's Bill Gates stared down the government, describing its economic prescription as being incapable of moving Nigeria forward, and urging investment in Nigerians. When I reviewed 'Emerging Africa,' I had no way of knowing Moghalu would be running for President of Nigeria within three years. His ideas would have remained relevant had he opted to stay out of politics, but by throwing his hat in the ring-and given the philosophical and administrative deterioration-they are and must become front and centre. In a recent article, he said, "As president of Nigeria, I will provide inclusive leadership that is anchored on a Big Hairy Audacious Goal that unites us all to face the future... I am not and will never be an ethnic candidate for the presidency of our country. I am unapologetically a Nigerian candidate for the Nigerian presidency. We must create a rising tide that lifts all boats, not just those of relatives and tribesmen and women." Moghalu's candidature thus returns us to the early years of African independence, when such men as Kwame Nkrumah, Nnamdi Azikiwe and Obafemi Awolowo stamped their identity on political thought with clear-headedness and patriotic zeal. You do not have to be a highly-educated man or an author to run for high office, but the discipline to be one or both is a gift, and one of the problems with leadership in Nigeria has been a potent anti-intellectualism which embraces intellectuals only for the objective of neutralizing or compromising them. That would change: Moghalu is not afraid of ideas, or of people who have ideas that may be better than his own, partly because he is himself an idea, and has led a life of the better, brighter idea. His presidency would introduce for Nigeria not only a politics of idea and strategy and organization, but of rigour in public sector management. Moghalu's presidential candidature is also something else: definition. He is defined by the consciousness that Nigeria, as a key part of the African demographic, has a lot of catching up to do, with the confidence it can be accomplished through dogged policy and institution-building and implementation, and the use of the best minds and hands. Moghalu arrives at a time when the military/pseudo-civilian political bloc, which began with Buhari 1, in 1983 closes ironically with Buhari II, having run a limp course of ineptitude, incompetence and lack of patriotic drive and left Nigeria flailing on the under-developing concourse. If Nigerians recognize the opportunity now to bury that mistake with determination and capacity, Moghalu is a welcome offer. It is now a little over one year that a wonderful Nigerian, Onukaba Adinoyi-Ojo, died in tragic circumstances on a Nigerian highway. In a story on March 12, I announced I was collaborating in Lagos on a trust fund, the FBNQ/Onukaba Adinoyi-Ojo Memorial Trust Fund (TF), to help his young family. The effort was coordinated by Taiwo Obe. It further turned out that a similar idea, for an Endowment Fund (EF), had been initiated in Abuja by Onukaba's erstwhile boss, former Vice President Atiku Abubakar. That announcement was made at the Eighth Day Islamic prayers, at which Mr. Abubakar sent a timely assistance package of N1m to the family. Following the formal launch of the Fund, Tunde Olusunle was entrusted with its administration. In mid-2017, in recognition of the fact that the objective of both Abuja and Lagos were the same, I helped to unite both efforts. Only last week, however, we learnt of the existence of yet another account, at FBNQ Abuja. We lack details of the said account; ours currently being only at FBNQ Lagos and UBA Abuja. I would have loved to report that hefty sums of money have been received from the vast network of people Onukaba touched in his 57 years, or that all those who pledged publicly have contributed. I would also have loved to report that each account has been nice and tidy, but both claims would be false. A family's needs do not often wait, and in this case some funds were disbursed either as they came in, or to settle one or two loans. For interested contributors, I am pleased to say there are bank records, as well as reports by Messrs. Olusunle and Obe, two energetic friends to whom this effort owes a debt of gratitude. In June 2017, the TF held N1.6m, while the EF stood at N3.8m in January 2018. The former now stands at about half a million-naira following two school payments for one child in September 2017 and March 2018. I want to mention one name, for obvious reasons: Hans d'Orville, an old friend of Onukaba's from his New York days. Last July, Mr. d'Orville, who now lives in Paris, was kind enough to offer financial assistance towards the education of one of the children. He has been as good as his word: in September, upon receiving a N1.5m school invoice for the 2017/2018 academic year, he graciously sent €1,730.00, which exchanged for 707,250,00 and was paid to the school. It is my hope that, depending on how many years or levels of education he has in mind, the trust executors would focus-at least for academic purposes-on the other children. Finally, I appeal to those friends who haven't contributed, and those with an outstanding pledge, to honour Onukaba, today.